First of all you have to assign clips to a project. By default, clips are offloaded into the project currently selected. You can create a new project by using the project selection menu on the top center of the main UI window. Additionally, it’s possible to select a folder from the library tree on the left panel before starting. 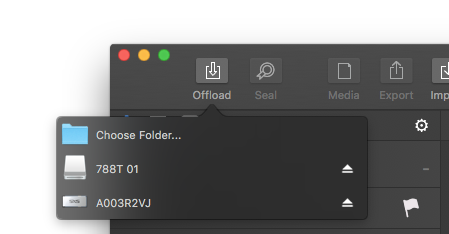 This way you will be able to set the folder on which the bin containing the new clips will be placed within the Project Library. That bin will have the same name as the source volume storing the footage. In case the current selection in the library tree is a bin, a new bin will be created as a sibling of the selected one. Click on the ‘Offload’ icon on the toolbar and select the volume you’d like to offload from. Choose Library > ‘Offload’ from the Silverstack menu. Right click on a folder or bin in the Project Library tree (left panel) and choose ‘Offload’ from the context menu. Drag the folder or card from Finder onto Silverstack’s icon in the Dock window. 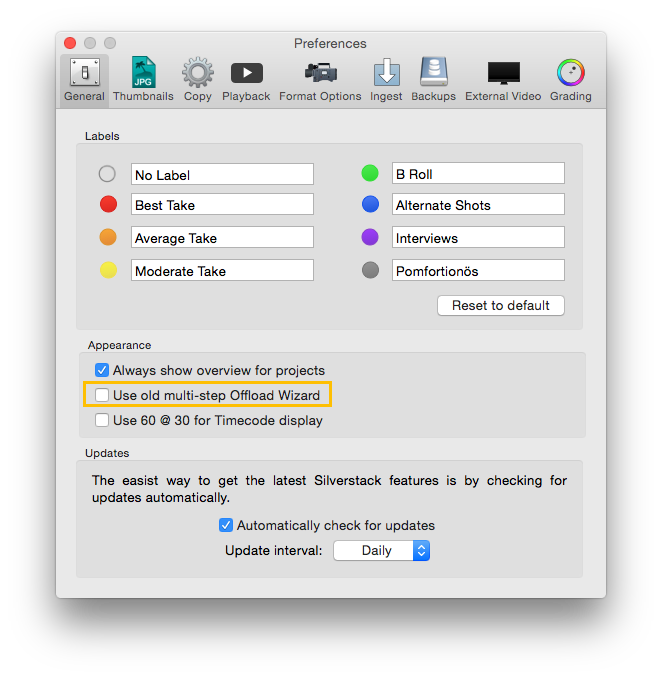 When using options #2 and #3, a Finder directory browser will open and you’ll need to select the volume or folder you’d like to offload from. The ‘Offload Wizard’ is the popup window that appears after choosing the Offload source. At this stage, Silverstack will try to automatically detect the camera format by scanning the files. After scanning the chosen source drive, all found files will be shown in a table. If, in an exception, Silverstack should not choose the right camera format, you can set the correct format by clicking on the ‘format selection button’. The import options for the multiple camera types can be found and edited in the application preferences menu, under the Formats tab. 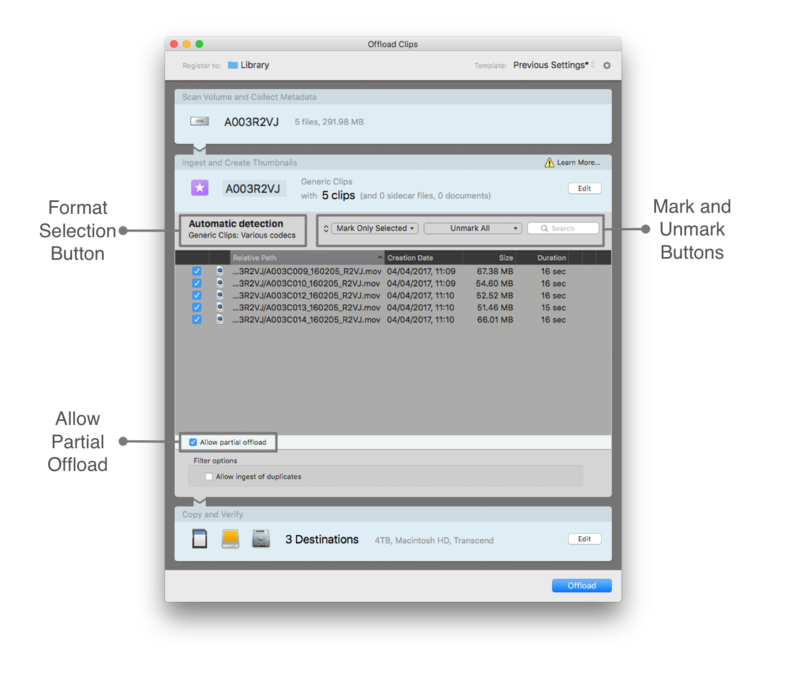 Silverstack by default offloads all the clips and files contained in the scanned device. Additionally, if you just need to offload a subset of clips, you can check the ‘Allow partial offload’ checkbox. Clips can be marked and unmarked either by using the checkboxes or the ‘mark’ and ‘unmark’ buttons by the ‘search’ field. Therefore either select all clips you’d like to import and then click on ‘Mark Only Selected’ or select those clips of all already marked that shall not be imported and click on ‘Unmark Selected’. Additionally, Silverstack is prospecting for duplicates (clips already existing in the Project Library) when scanning a source drive and prevents them from being offloaded by default. If you need to include duplicates nonetheless, please enable the ‘Allow import of duplicates’ checkbox. Sometimes Silverstack will skip some hidden files and empty folders during the copy process, as shown in the image below. If you click on ‘Learn More’, a popup window will show which files are ignored. When you are done with your offload source choice, you can proceed to add the copy destinations. Adding a new destination is done by pressing on the ‘+’ button on the lower left of the table. Click the ‘-‘ button next to it to if you’d like to remove the selected destination drive. 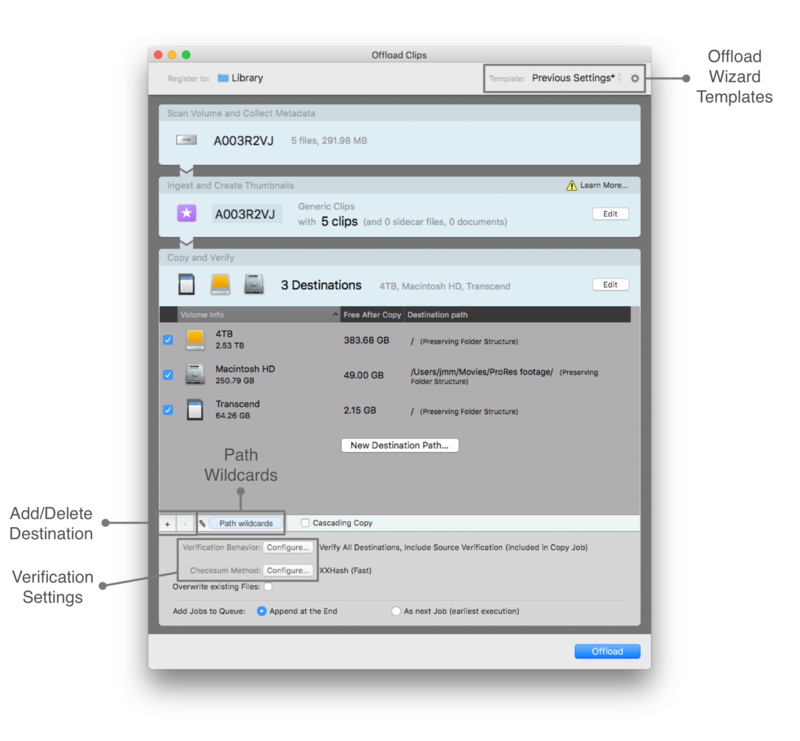 Additionally, Silverstack offers the possibility of saving offload wizard templates. These templates can be chosen through the drop down menu on the top right of the Offload Wizard. For more information about the templates, please check the article Offload wizard templates. For a detailed description of how the copy and verification process works in a cascading copy scenario (Silverstack XT and Lab), as well as other available settings for this mode, please check the knowledge base article Cascading Copy. After determining your copy destinations and settings, click on ‘Offload’ to register the clips to the library. Silverstack will ingest all the metadata from the clips and create thumbnails for them. Once that process is complete, the copy and verification job is going to sart. All the information about the offload process can be supervised in the Jobs panel. Note: if you just need to create references to video clips in the Project Library and skip the copy and verification process altogether, please check the knowledge base article Adding Clips to the Library (Ingest without Copy).